Columbia, Mo. (June 2, 2015) — Research has shown that media, such as television and video games, can affect viewers’ thoughts and actions. Now, new research by Cynthia Frisby, an associate professor of strategic communication in the University of Missouri School of Journalism, has revealed racial stereotyping in the way media portray athletes. Frisby found that media stories on African-American athletes focus primarily on criminal actions while stories about white athletes are overwhelmingly positive. For her study, Frisby examined 155 news articles about male athletes from online and print news sources to determine the theme of each story. The themes identified included crime, domestic violence, training/hard work, moral success or failure, violating rules of the sports league, accomplishments and personal lifestyle. 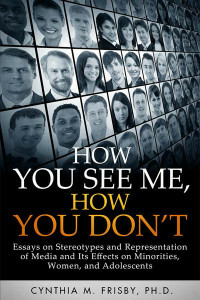 The book, How You See Me, How You Don’t, explores racial stereotyping in the way news media portray athletes. Frisby found that overall, more stories were written about white athletes (43 percent) than black athletes (39 percent). Frisby also found that more than 66 percent of the crime stories involved black athletes while only 22 percent involved white athletes. More than 70 percent of domestic violence stories involved black athletes and only 17 percent involved white athletes. Finally, 53 percent of the stories involving black athletes had a negative tone, while only 27 percent of stories about white athletes were negative. Frisby says these statistics point to an existence of stereotyping in the sports media. Frisby says this study, while only a first step, sets the stage for future research examining negative portrayals of black athletes in the media. This study was presented at the International Communication Association conference in May and was published in Frisby’s new book, How You See Me, How You Don’t, which is a collection of more than 15 studies performed by Frisby examining various aspects of media stereotypes and their effects on minorities, women and adolescents. Other studies in the book include an examination of media portrayals of women in reality television shows, violence in video games, gender and race in political campaigns, and how advertisements stereotype various genders and races.